Those who have followed Depp’s career know that he has a stunning resume, including Edward Scissorhands, Charlie and the Chocolate Factory, and the Pirates of the Caribbean franchise – to name a select few. Those who have not followed his career may not know that his passion for performance extends to music as well. 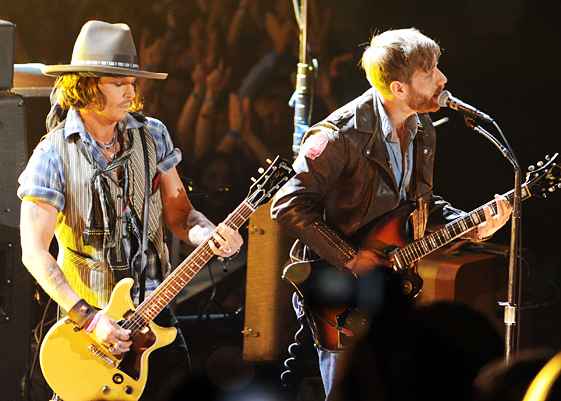 Depp celebrated his award with a guest performance playing guitar alongside the Black Keys for their song “Gold on the Ceiling.” To the millions who watched the performance, it would be hard to say whether he is more passionate about acting in films or being on stage with a guitar slung over his shoulder. His performance at the MTV Movie Awards is not his first time performing on-stage. The start of his acting career manifested from his move to Los Angeles decades ago with the hopes of becoming a famous rock star. As a teen, Depp fervently practiced on his guitar with dreams of success in mind, and even started a band named the Kids, but he ultimately found a different kind of success. Although Depp has appeared in over 50 dramatic indie films and blockbuster movies, earning him a permanent place on the celebrity A-list (as well as a star on the Hollywood Walk of Fame, numerous Oscar wins and nominations, and multiplying tattoos that have gained as much attention as his films), he never lost his desire for performing music. Depp has made connections and performed with musicians, including Tom Petty, Oasis, The Pogues, Keith Richards, Alice Cooper and most recently, Marilyn Manson and Patti Smith. His performance on guitar of “The Beautiful People” with Marilyn Manson at the 2012 Revolver Golden Gods Awards was an unexpected move that shocked and pleased both Depp and Manson fans.